Application Deadline: 15th January 2019. 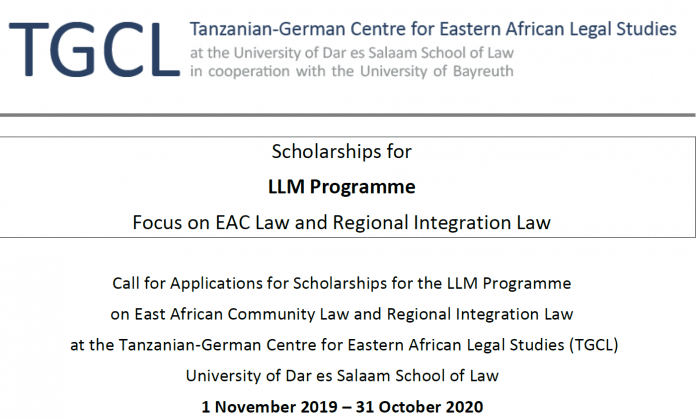 Tanzanian-German Centre for Eastern African Legal Studies (TGCL) invites applications from candidates from the East African Community Partner States (i.e. Burundi, Kenya, Rwanda, South Sudan, Tanzania and Uganda) for LLM studies starting 1st November 2019. The candidates will pursue an LLM programme on East African Community Law and Regional Integration Law. The programme takes one year of full-time attendance. On successful completion of the programme, a student will obtain a Master of Laws degree from the University of Dar es Salaam and an additional TGCL Certificate. There is a significant research component to the LLM programme in the form of a dissertation. All LLM dissertations must focus on East African Community law (EAC law), if possible, in relation to the student’s national law. a signed curriculum vitae with clear evidence of periods of legal and other relevant education, training and practical experience. It is compulsory to use the Europass CV template (http://europass.cedefop.europa.eu). a proposal of the intended research (1,500 words) – see annexed guidelines. It is important to include your name on the proposal. This advertisement is for scholarships offered by the TGCL. Admissions to the University of Dar es Salaam are made by the University administration separately and independently. TGCL scholarships can be granted only to candidates admitted for studies at the University of Dar es Salaam. TGCL will inform successful scholarship applicants early enough to allow them to apply for admission in the University of Dar es Salaam. They will have to follow up postgraduate admission advertisements at the University of Dar es Salaam website and apply for admission as soon as the same is posted. A comprehensive and thorough reading of relevant materials is necessary as part of the preparation for an acceptable research proposal. The topic and the research proposal should be on a very specific legal problem within a particular area of law. It is therefore advised to avoid general topics such as “A comparison of trade law in Tanzania and Kenya in the light of EAC law” or “The relevance of the rule of law in East Africa” as they are too broad and unspecific. The proposal should contain a detailed outline which reveals the intended structure of the dissertation. The proposal should be accompanied by a bibliography containing the most significant primary sources and secondary literature in the field with precise references. The proposal shall not exceed 1,500 words and must include your name at the top of the paper.